Wow! The response to my big announcement yesterday has been amazing! Thank you so much! So many of you have left me wonderful comments either on this blog or through email. I was actually crying (happy tears) when I was reading through them this morning. I can’t express how much all your support means to me. Question #1 – What’s In It? Many of you are asking what my new book is about. The truth is, I don’t want to ruin the surprise for you yet. It’s coming though. I will have a very detailed description of precisely what is in it for you on Friday morning (Sydney time). I can however, reveal three very special FREE bonuses that will be included with every order. I wrote these for you in response to the survey I sent out a few months ago asking about the problems you face when making cards. The number 1 problem by far was staying inspired and trying to find new and fresh ideas. But there were other common issues too. Card making is all about fun and creating something beautiful for someone special but many of you are struggling to figure out what to do. I felt it was important to address these issues that are keeping you back so that you can get the most out of this wonderful hobby. Problem #1: Not knowing which tools to buy and which are a waste of money. Solution: My guide to the essential tools of card making. See what I use and why. Included FREE with my new book. Problem #2: Finding adhesives that aren’t too messy and that actually work (no-one wants their cards falling apart). Solution: My guide to the adhesives I personally use for all my card making projects, including what I use to stick paper together, how I adhere vellum, what I use for heavier objects and more. 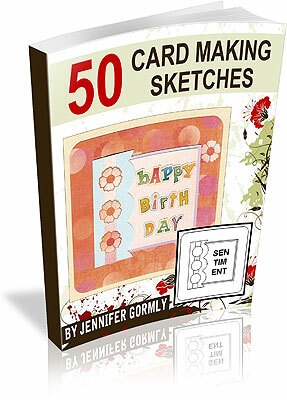 Problem #3: What to say on cards other than the usual “Happy Birthday” or “Thank You” messages. Solution: My collection of 81 birthday quotes compiled especially with card makers like you in mind so that you’ll always have a fun saying or sentimental message to include on your birthday cards. PLUS – Watch out for a very special bonus for the first 100 people. Question #2 – Will It Be Available In <Insert Your City Name Here>? You all come from so many different places around the globe. We have members everywhere from Australia to the US to the UK. If you read through the comments on this blog, you’ll find we even have members from countries like South Africa, Denmark, Costa Rica and Guatemala! We are a truly international community and I wanted to make sure that noone is disadvantaged by their location. So that is why my new book and all the free bonuses will be 100% downloadable – just like the free reports I have already given you. So it doesn’t matter where you live! The added advantage is that access is instant. As soon as you order your copy, you will be taken to a download page which will enable you to save your copy to your computer to access any time you want. If you order at 7am (Sydney time) this Friday, you could be reading it by 7:05am! And of course, that means there’s NO expensive shipping cost! Question #3 – Is There A Guarantee? All orders will be covered by my 100% no-questions-asked, hassle-free, money back guarantee so if you try it out and find it just isn’t for you, you can get a full refund of your purchase. I wrote 50 Card Making Sketches to help and inspire you so if you don’t feel that it does, I want you to have your money back. Question #4 – What Will It Cost? I’ve worked very hard to ensure that you get tremendous value from my book. I’ve included all the tips and secrets I use for making cards to help you find your card making confidence and create cards you will be proud of (and your card making friends will be envious of). If I sold the bonuses individually, they would add up to $76.00 US just by themselves. But my whole package isn’t going to cost anywhere near that much. In fact, it’s less than half. And for the first week, I will be giving you a HUGE discount as my way of saying thank you to all of you for your kindness and support. Keep your eyes open on Friday morning (Sydney time) for your special price. And that’s about it. I hope I’ve covered everything for you. If you have any more questions, please let me know. And remember, there will be an extra special bonus for the first 100 people. I’m so excited. My report is now ready! Many of you told me how much you struggle to find ideas and inspiration for your card making so I wanted to help. I have been busy working really hard creating a very special report just for you. Inside I reveal the secrets behind my ability to create one spectacular idea after another with ease. You’ll be amazed at how simple it really is. Everyone can do it! Once you have downloaded it and read it, please come back to this blog. I have spent many hours working on this report for you and I’d love to know what you think. Please let me know by leaving a comment for me below.